Hawk Nelson was formed in Peterborough, Ontario, Canada in 2003 by Jason Dunn, Dave Clark, Matt Paige, and Daniel Biro. The band played independently in Peterborough, Ontario for a few years before they signed with Tooth And Nail Records. 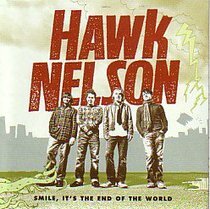 In July of 2004, Hawk Nelson released their major label debut Letters To The President. In October 2005, the band re-released Letters To The President, with new material including their cover of The Who's My Generation, three acoustic versions of some of their hits, and a limited edition cover. Dave Clark was replaced by Jonathan Steingard on guitar in 2004. The band released their second studio album, titled Smile, It's The End Of The World, in 2006. The album's first single, Everything You Ever Wanted, went on to hit #1 for 9 weeks on the R&R Christian CHR chart, and was the fourth most played song of 2006. Hawk Nelson released a 3-track Christmas EP titled Gloria on November 21, 2006.